A review of Quick and Easy Scrapbook Styles by Memory Makers. Readers will also find inspirational artwork from some of Memory Maker’s most talented commissioned artists as well as helpful sidebars that explain techniques and shortcuts. 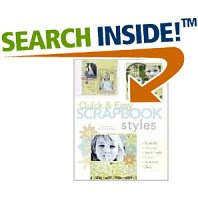 With this fun guide scrapbookers of all tastes and skill levels can make their own quick and easy pages. I am always intrigued by the books the label styles in this way. I am aware that there are some distinct styles; however, I think that any scrapper who has been scrapping for any length of time has experimented at least a little in all styles and if they haven't, they should give it a try. Books like this are great tools to help you hone in on the principles and elements of your favorite style(s) and/or to step beyond the boundaries of your 'comfort zone' to try other styles of scrapbooking.